Remember the tiny little Game Boy Micro? Meet the Game Boy Macro, crafted from the once-dead remains of a Nintendo DS missing its top screen. 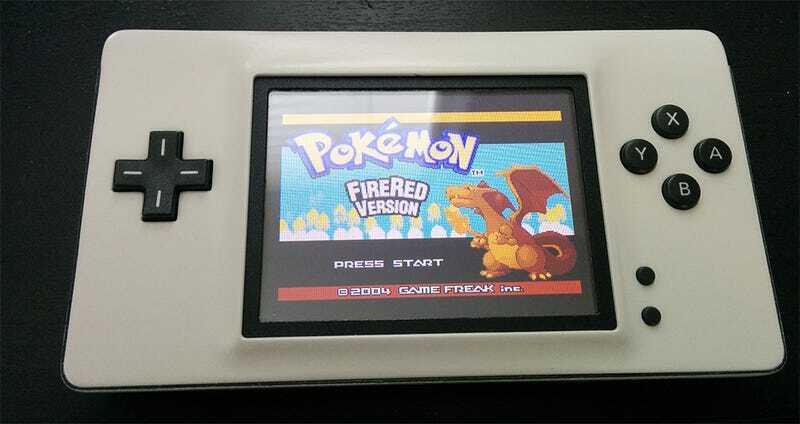 Electronics modding enthusiast Anthony Thomas (via Reddit) was looking for a simple project to take on and noticed there were a lot of older Nintendo DS Lites missing their top screens. That’s bad for Nintendo DS games, but with all the hardware the DS needed to play Game Boy Advance and older cartridges, Thomas decided to grant them renewed purpose. Using sheer electronic wizardry, Thomas figured out how to get the lower half of the DS to boot without the upper, then figured out how to do it correctly instead of simply adding a second power LED, because no one needs two power LEDs. Once the innards were working, it was only a matter of some more advanced electronic black magic, transforming the shell into a more self-contained unit through sanding and application of Bondo and moving the speakers. What a gorgeous machine that is. It’s got everything one needs to play Game Boy games of all sorts in a incredibly sleek package. Thomas not only documents the building process at his personal site, he’s set up a site where folks can buy them as well. A Game Boy Macro runs $130 if he provides the materials, $110 with your own. Mind you this has been all over the internet over the past day, so chances are his work load is already pretty massive. Update: Anthony suggests interested parties keep an eye on the Game Boy Macro Facebook page for updates.